Dec. 24 Mikulov to Poysdorf, Austria 20km. 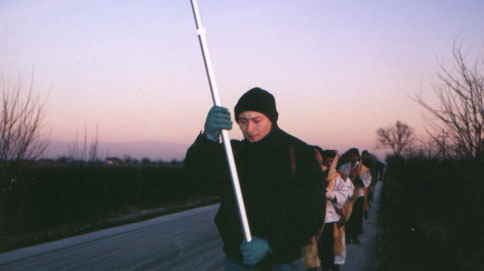 Interfaith Pilgrimage for Peace and Life 1995: On Turtle Island. Why Walk in the Southeast United States? 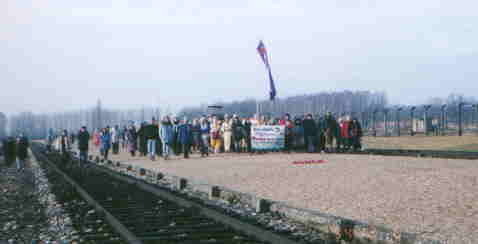 Interfaith Pilgrimage for peace and Life 1995 started in Auschwitz last December. Having accomplished a Convocation at the ex-concentration camp site, now the pilgrimage is walking through Eastern Europe, hoping to get to Israel on February 1st. At the time when the earth is in crisis, we feel that one of the simplest and the most important things we can do is to pray for peace. 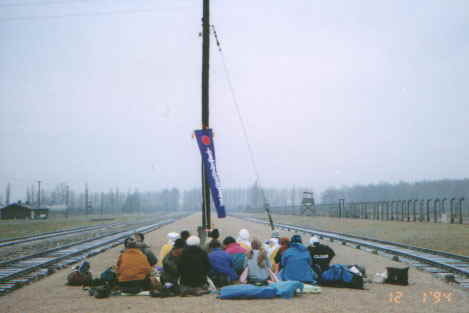 As the walkers proceed the route, they encounter many people who would pray with them. Indeed, walkers are not the only ones representing the walk, but all the people who make connections to the walk are already a part of a long the walk. In this news Letter, we try to collect the voices of the pilgrimage and share them with you. You have been going through the world, you program peace and pray for the victims of all the wars. We admire you : we - the livers of a little town, SKOCZOW. We also desire a real revival of humanity. we want the earth to be without the hunger and wars. Although we can't go with you and pray, but we are with you and our hearts are with you. We wish you the strength, perseverance and we want whole the world to hear your call. Asked of us mirth, saying "Sing us a song of Zion"
How are we to sing the Lord's song in a strange land? If Ido not remember thee! Each of us is that wanderer in a strange land. What would it take to bring us home? Just as we received the world to hold in trust from our forebears. Never as a possession to exploit, Always as our home to cherish. "We Germans began the Second World War and have therefore been more than anyone else responsible for the immeasurable suffering of humanity. In sinful rebellion against God, Germans killed millions of Jews. Those of us survivors who did not want this to happen did not do enough to prevent it. These facts still deprive us of our peace, mainly because there is too little reconciliation. We can still, regardless of our duty to take conscientious political decisions, oppose self-justification, bitterness and hatred with strength, if we ourselves truly forgive, ask for forgiveness and live by this conviction. " Auschwitz has become the foundation of the reality of our times. It demonstrated that it was possible to create a society and a state in which every decision causing the murder of millions could be arrived at through rational detachment of a bureaucratic apparatus, with decision-makers physically and morally removed from the consequences of their acts. It has shown how in our time it became possible to degrade and dehumanize people and then to discard them without shame and with the compliance of the majority. Our militarized nuclear national security societies of official secrecy, censorship, and vastly advanced sophistication in media manipulation create a world of the living dead, with large parts of entire populations numbered, emotionally deadened, addicted, frozen in denial, dysfunctional in home, community and work. Social breakdown and cataclysm will continues, as seen in Africa, Russia, Yugoslavia, Chernobyl, Los Angels and London, as long as ideology and practical considerations of expediency prevail over the guidance of moral and religious teachings. These universal tendencies of the Nazi era and the Jewish Holocaust reveal starkly and, I humbly hope, clearly the emptiness of the inflated pride by which we wrap ourselves in the mantel of "progress", crowned with the laurels of "Western civilization. "For half a century we have lived in the blood of complete self-contradiction, ever causing increased suffering for millions of innocent, vulnerable and beautiful people and now poised for complete self -destruction. "What a surprise! I had never expected to receive this much positive energy from Auschwitz. I felt as if I came back to an old place where I had lived long time ago, although this was my first time traveling there. The energy of the place felt so familiar to me. It was an incredible positive energy which must be attribute to all the prayers of people for peace grounded into this place. And it is suppressing the huge negativity of the Holocaust as it tries to create harmony. Having participated in the fasting and Convocation, I felt so refreshed and energized. . . It was a message to me that we must live strongly and positively, for the sake of all the people whose lives sacrificed. And the time is now---let us in rejoice life and live our life in peace. 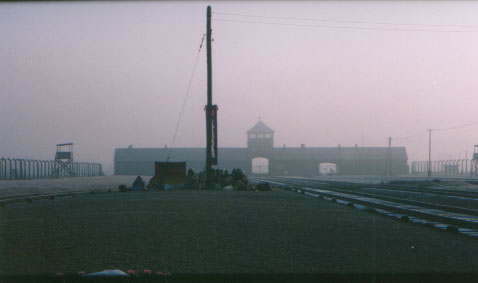 Auschwitz taught me that all lives are connected; we are truly one life on the face of the earth. I am deeply grateful for this beautiful time that I was given in Auschwitz. " We entered Auschwitz (Oswiecim in Polish) by train from Vienna, Austria. I was fortunate to have the time to visit the Museum of Auschwitz before the planned fast. What I found there, however, were the horrifying facts of the reality of Auschwitz. This reality went beyond anything I could ever imagine. In 1929,this concentration camp was first established as an execution center for Polish political detainees. In 1939 it became the largest center in Europe with the expressed purpose of exterminating people of Jewish descent. This was the beginning of genocide. Many people brought here were sent directly to the gas chambers without even the registration of their names. Based on the incomplete documentation existing today we found over 1.5 million people were killed at Auschwitz. The victims included Jews from all over Poland as well as Slovak, France, Belgium, and the Netherlands. Jewish captives of the Russian military, of Germany, Lithuania, Norway, Hungary, and Greece were also brought here. Gypsies, as well, were also among those brought to Auschwitz. Many of victims were under the impression that they were just being relocated to Eastern Europe. Greek and Hungarian Jews purchased farms, land, and stores from the Nazi that didn't even exist. Those that were sent here lost everything. The few who managed to avoid the gas chambers suffered from hard labor and starvation. Some were used as "medical experiments." If anyone tried to escape they were tortured, shot, or hung as examples to other with similar ideas. In the exhibition room of the museum there were over seven tons of hair from the victims. This hair was used by Nazis to weave military uniforms. The ashes of the burnt bodies was used as fertilizer. In the same room there were also displays of the daily life of captives. They were force to work for over twelve hours a day on very little to eat. Naturally many died of hunger. The Nazis told the captives that they could takes a shower and sent them into the gas chambers. I stood inside one of these gas chambers and in the torture room; and then I walked through the gate, above which read: LABOR WILL MAKE YOU FREE. I felt the suffering and the sorrow of the victims from the depths of my heart. Because of the weight of such a reality I got sick and had to stay in bed all of the next day. We started fasting the following morning at Bilkeneau where the second concentration camp was built. This camp is seven times larger than the first one. Although we had anticipated cold weather during the Rohachi Sesshin, the fasting practice, it was actually quite warm during the day time. It snowed a little on the first day and there was frost on the ground the whole time. On December 5th and 6th, the latter half of the seven days fasting, it rained in the afternoon, relieving us from the cold weather. There were twenty to thirty-five people participating throughout the fast and it was good that we could chant, pray, and drum together on the earth for the seven days. "The spirits of those who suffered here have shed tears of joy on us. They will be guiding and helping us on our way to Hiroshima. As I look around at scenery of the sky, of the heavens, I truly believe this." On December 5th, Dennis Banks, a leader of the American Indian Movement, come to support us, When the rain came down on us he cheered us up, saying: "This rain is to purify us. Your prayers will purify the Mother Earth." This Rohachi Sesshin, this fasting practice, in my experience, was the smoothest of all that I have done in the past. I am grateful to be able to come together with a such large number of people to chant, drum, and pray at this very important place. After the fast I had chance to meet an old Polish man, a retired professor, who was working as a guide at the Museum of Auschwitz. He said that he had been captured by the Germans during WWll and during his captivity he was given a military uniform that had been woven with human hair. He told me that since he learned about the uniform he continues to be overwhelmed with a tremendous sadness. I also met a 57 years old German woman who said that her father was a Nazi. He was a part of the killing of the Jewish people. "I will walk from Auschwitz," she said, "as an act of reparation." In Auschwitz I met people who still carry the pains of war, after fifty years, with them to this day. It was a good lesson for me to rediscover the role of the pilgrimage. Over 200 people attended the convocation of Peace & Life which was held during the 5 days previous to the start of the peace walk. People were here from Australia, the U. S. , Europe, the Mideast and the Far East. There were many striking and moving encounters as we walked the paths where all peace was obliterated, and its absence still haunts the death camps of Auschwitz & Brkenau. But, there were experiences of hope and reconciliation too. One such was the celebration of the last night of Chanukah when Sasamori and the monks and nuns of Nipponzan Myohoji led us in procession to the gates of Auschwitz. We carried the minorahs we had made earlier that day out of tongue depressors and small brass tubing rings. We set the minorahs on the ground before the gates. As the rabbis and others lit the candles, their flickering light illumined the infamous motto above the gate at Auschwitz: "ARBEIT MACHT FREI, " Work gives freedom. Fifty years ago in this place only death gave freedom. The rabbis intoned the ancient Hebrew songs. In the glow of the minorah candles, Chanukah was a reality perhaps for the first time in the history of this terrible place. Standing there, I wondered if 50 years ago one of the prisoners might have had a mystical insight of what we were doing on this night of the Feast of Lights. Was it possible that in the bleak darkness of this death camp, a prisoner caught a glimpse of minorahs lighting the night of Chanukah and from this brief, mysterious sight he derived some hope that all life did not end in despair in this place of ultimate evil. Since all things are connected, it is to be hoped for that such an experience took place. Just south & a little west of Oswiecim, we completed our first day's walk at a town I can't even pronounce - Pszczyna. The day was foggy, mild considering we are nearly into the winter season, as over 80 people lumbering over tarmac & onto muddy shoulders. We were a scraggly group, upsetting the Policzya w/ our endangering walking mode. We were repeatedly warned to walk single file yet consistently wandered into the road. The warning was never stern - perhaps never stern enough - now we believe we will be made to not walk to our next destination, offered a ride instead. How unlike the walking mode just 50 years ago of Auschwitz - Birkenau prisoners who were forced to evacuate the camp as the Soviet Army approached. Then: "walk fast, no matter what your health! No food, little water, no shelter. Walk only at night (to not be seen by approaching armies). Too bad if you can't survive this regimen. We'll leave you by the side of the road!" We walk their same path at least to the Czech border. How unlike their experience is ours. We walk in their footsteps, eash step a remembrance, each step the flowering of a lotus blossom for peace. A garland of such blossoms, here to Hiroshima. Human you will understand Nature. You will for to Buddish Thaworn - Sook. 94 If the whole world treated all of life halfas kindly, gently, patiently and lovingly as have the Polish people treated the people of the Pilgrimage, we'd be in twice the shape we're in now. In fact, there'd be no need - other than for exercise, fresh and friendship - to have such a Pilgrimage. We are crammed in a small gym & some tempers have been flaring or threatening to flare. O well. Feeling slightly guilty to have set up earlier & have more space. Very tired sleepy at service tonight. Hate to feel these cross-cultural inter-religious events are becoming dull! Mostly I picked up this pen to convey what a profound impression this Peace Pilgrimage is making on me. I feel all the hospitality shown us, the great kindness, opening of auditoriums, gymnasiums, "sports dubs" and hotels not to mention the bills thereof for 80+ people AHD the great dinners - tonight with Czech Musical accompaniment are all testaments to the spiritual power of Rev. Sasamori Shonin. The strength, grace, humor, generosity, and devotion of the Nipponzan Myohoji monks and nuns is astounding. The power of their practice is very clear. The fact that 80 of us are following his original lone intention crossing cities, countries, boundaries of language and long held prejudice also shows the strength of his Dharma Light shining. Again & again I am reminded that this is not a vacation (although it often feels like it!) but our overriding purpose is to acknowledge the great suffering of war. I could not get there last night but I heard of a very moving sharing by a woman at the dinner, who is raising funds for a monument to the children of Lidici, Czech who were murdered by the Nazis. The warmth of all the Catholic parishes, to our multicultural inter-religious group, welcoming our varied prayers of varied sects in their churches, the speeches by mayors, the warmth of the local people is presented to and received by us personally but its inspiration is global and universal which must be recognized. We are walking and suffering for all beings, not just ourselves. The openness and energy with which the local people throughout S. Poland and now N. Czech speak of peace and the necessity of it really impresses me. It isn't an empty platitude to them - they feel it deeply - the citizens speaking out against the tyranny of world governments and their mixed motives. My original teacher Zen Master Seong Sahn did many solo 100 day chanting retreats. So I am struck by the walking / chanting practice which has a spiritual / political thrust. Because the motivation is so pure and devoid of self-interest, the people respond naturally and warmly. Nothing like political events back home. It's been difficult for me to stay in the front half of the line but when I've managed to be up there near the drums the rhythm of the chanting takes over - obliterating fatigue and sore muscles / feet. Lately I've been way in back or barely feel there was enough wind to walk. Atsuko stayed behind with me when I was limping and we chanted together by ourselves. It was great. These monks & nuns are like grants to me; I am brilliant light. Lights out more later. A cold, piercing wind blows strongly all day, especially as we walk by a large lake. We watch the man carrying the Gendaiki concentrating all his physical and mental strength to keep the prayer flag constant. On the way out of Pohorelice, the Catholic priest walks with us as far as a cross on the road marking. The place where 890 German people, mostly old people, children, died on a"dealh march"out of Czech, as was prescribed by the Potsdam treaty. The conditions the German people suffered by this forced march were a little reminiscent of the terrible"death marches"of the Auschwitz prisoners just before the end of the war. 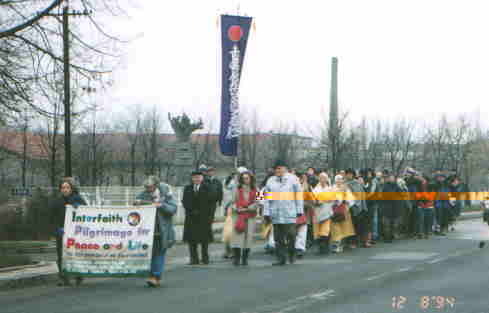 The local Catholic priest and people expressed sincere pain that the "death march" of the German ancestor residents of Czech had to experience such suffering and deprivation. 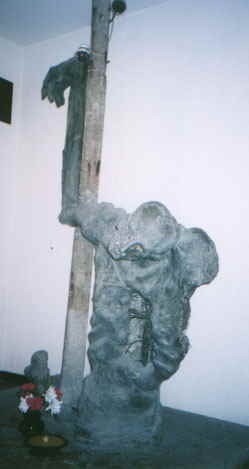 We pray that step by step, more repentance can be sincerely opened for the crimes and inhumanity of WWll and all wars. Mikulov is an extraordinarily beautiful old town, with a castle and mediaeval town square. We stay in the local grammar school and are treated to an evening of sweet organ music in an almost 400-year old church. In the church there is a shrine to a beautiful statue of a Black Madonna. There are images of Black Madonna in various parts of Europe, and they are worshipped as having special powers of protection and compassion. Most contemporary Europeans have no particular explanation about these images but some believe. They come from more ancient culture (pre-Christian) in Europe which have blended with Christianity. Gypsies usually worship these paired images, too. Mikulov to Poysdorf, Austria 20km. An easy walking day to Austria. After arriving at the stay-place the local priest welcomes us. We attend Christmas Day Mass at the local church. The priest gives a wonderful sermon about the Pilgrimage.He mentions that Auschwitz was in the darkest hour, and that this Pilgrimage is bringing light. It is hard to imagine in a conservative country that the priest is rnentioning Auschwitz to the congregation on Christmas. It seems almost a miracle! Also, at the end of Mass we pray with the drum, and we walker offers Jewish prayer and one Catholic from Central America. There are prayers in German about ending anti-Semitism (anti-Jewish thinking and action). Truly, unexpected blessings coming from this prayer Pilgrimage. In solidarity with the pilgrimage, we are walking on the Turtle Island, USA and Canada, carrying the same spirit for peace. Why Walk from Plymouth to NY? There are strong historical connections in the area. Plymouth, Massachusetts is known as the first arrival port of pilgrims and other European settlers from which a blatant genocide of native peoples had began. Enola Gay, the military plane that carried the atomic bomb mission, was based on Plymouth, MA. "Bretonwoods Conference, "held immediately after the war to discs war compensation, took place in Bretonwoods, New Hampshire. The route of the walk thus allows us observe many World War ll events along the way The Walk ends at the United Nations to support the"International Citizens' Assembly to Stop the Spread of Weapons, "organized by non-government and citizens groups on April 20-21, 1995. This event will be a people's response to the UN conference on the Non-Proliferation Treaty(NPT), also taking place in April, 1995. The International Citizen's Assembly seeks to "convey our message to the UN and to all the governing bodies of the world that "non-proliferation means disarmament, "the concept embodied in Article VI of the Non-Proliferation Treaty. " Teaching peace is not new, especially on Turtle Island, the continent of America. Peoples of Six Nations ( Cayuga, Mohawk, Oneida, Onondaga, Seneca, and Tuscarora ) of the East coast have carried their teachings of peace for over thousand years. Chief Haudenausaunee, or Peace Maker, told his vision to people: bury all weapons in the ground and plant a tree of peace above them. This was an effort to transform the hatred of war and killing into the love of peace. It is time to have a new contemporary understanding of this teaching. Bombs were used in the war and have been exploded in numerous places on our mother earth. We must hear her cry and heal the wounds, for our survival depends upon it. We walk, therefore, to the birthplace of Peace maker, in Destronto, Canada, and around Lake Ontario where he traveled, seeking to bring his wisdom into the present. Contact point./Nipponzan Myohoji. Nun. Jun Yasuda. St.Marys, GA to Oak Ridge,TN. 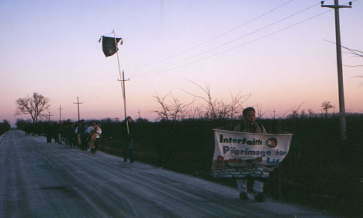 The peace walk in the southeast from St. Marys,GA to Oak Ridge, TN, will trace the area's role in nuclear weapon's history. The walk begins May 1 in St.Marys at the Trident submarine base, home of the deadliest weapon in the U.S. 's nuclear arsenal. The Trident was built solely to attack the Soviet Union's missile silos and though those targets no longer exist, yet more Trident are being built. The walk will pass through Aiken,SC, where the nuclear weapons.facility the Savannah River Plant, is located. Here government produced tritium for nuclear weapons. Tritium for nuclear weapons. Tritium is no longer produced, but decades of bomb-making has left an environmental catastrophe that will burden future generations. Finally, the southeast leg of the walk will end at Oak Ridge, TN, where the atomic bomb dropped on Hiroshima was built. This walk back through history, from the present horror of the Trident to the past tragedy of Hiroshima, will be a time to reflect on our nation's role in the arms race and its effect on the world. It is also a time of prayer and renewed hope that this country and the world can be converted from preparing for war to building a strong and lasting peace. Fifty years of nuclear weapons has not brought us security, prosperity or peace. We walk to commit ourselves to the creation of a peaceful future by transforming our confused and fearful mind. Trust and generosity are true values of humanity yet to be fully uncovered. This is our task now and in the century to come. 1127 Glenwood Ave,S.E. Atlanta,GA 30316 USA.